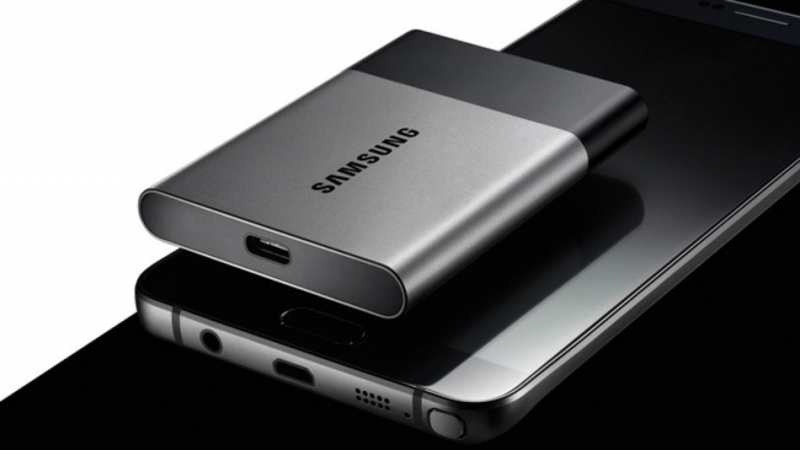 At CES 2015, Samsung revealed its first portable solid state drive to the public. The T1 offered a full terabyte of storage and fast speeds in a tiny casing that could fit in your pocket. One year later, and Samsung has shown off the T1's faster, bigger (capacity-wise) and better successor – the T3. The new T3 SSD (it’s not called the T2 as apparently there were issues with the Chinese translation) is, like the T1, available in several capacities. This latest model, however, goes all the way up to 2TB, as opposed to the 1TB maximum that was available with the T1. The T3 is a tiny bit bigger than its predecessor, but it’s still smaller than most business cards (2.91 x 2.28 x 0.41 inches). And while it may be twice as heavy as the T1, you’re still unlikely to notice the T3’s 1.8 ounces (51 grams) in your pocket. Plus, that extra weight has gone into the drive’s new shock-resistant metal case and internal frame – the T3 can withstand 1500G of force and a drop from up to six feet. Samsung also said it has an integrated Thermal Guard feature that prevents overheating in extreme temperatures. Like the T1, the T3 uses the same vertical 3D-NAND (V-NAND) memory found in Samsung’s 850 EVO drive and is capable of read/write speeds of up to 450 MB/s. The T3 also supports USB 3.1 and Type-C connections and comes with a USB-C to USB-A cable. The T3 also supports Samsung’s TurboWrite caching technology and offers AES 256-bit hardware encryption to keep your data safe. You can even use the companion Android app to change your password and check storage levels from mobile devices. The T3 will launch in the US, China, Korea and select European markets next month, with other regions following later. Pricing has not yet been announced, but expect the T3 to come at a premium, especially the 2TB model; the terabyte version of the T1 was $600 at launch, and similar 2TB portable SSDs are currently available around the $800 mark. oh sorry...that was me just waking up. Yes..this ssd seems ok to me. Very natty, I like it. I saw a 500GB model in the video which would be an ideal size for me but sadly they're just too pricey for what they are and considering the price of NAND flash these days. Samsung wouldn't look out of place armed to the teeth and wearing ski masks while trying to punt it. Does your system boot to USB?